Run either one or two gels simultaneously on these versatile separation systems. Similar to the 1010 unit but designed to run one or two larger format 20cm wide x 10cm tall gels. 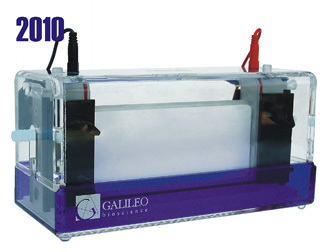 Unique casting base allows both casting and running of the gel without unclamping from the upper buffer chamber, providing for safer and more convenient gel handling. Water cooling feature is included for protocols that require it. Connections are easily made by attaching standard tubing over the 3/8" barbed in/out ports provided on the device. Water may be provided by tap or other temperature controlled water source. Optional alumina backer plates may be used to facilitate cooling efficiency and uniformity, and is shown in the accessories list below. Heavy duty upper buffer chamber with cooling port connections. Interlock safety lid with attached leads. Two 15-well, 0.8mm thick combs. Two 20-well, 0.8mm thick combs. Choose amoung these accessories to customize each system for your specific needs. Alumina cooling plate. For use with cooling systems. This plate can be sandwiched between the gel and the inner buffer chamber to improve overall temperature uniformity. Casting base. For quick, efficient and leak-proof casting.